We are all familiar with light reflection — it’s why we can see ourselves in a mirror. 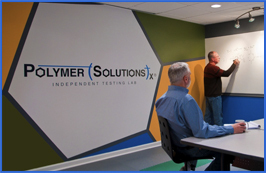 Sometimes reflection becomes a distraction, and one solution is to use anti-reflective and anti-glare plastics. Sometimes reflection can be the only way to see an object, such as the moon, in the dark. Reflective paint on the roads and road signs helps us drive and land airplanes at night. What makes reflective paint appear so bright is the presence of tiny particles that use the property of retroreflection. A retroreflective object reflects the light back to its source with minimal scattering by sending a nearly parallel ray of light in the direction of the source. 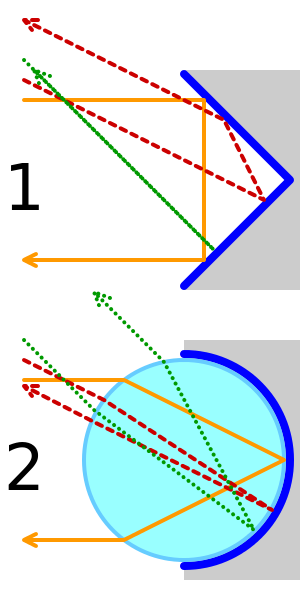 There are two simple types of retroreflectors. The first is a corner, or pyramid, reflector, which has three perpendicular surfaces like the corner of a cube. The second is a cat’s eye reflector, i.e., a transparent ball with reflective back surface. The light reflects back to the source as seen in the diagram. Retroreflective paints contain small, particulate reflectors as additives. Usually they are small, (0.1 to 1mm) round, highly transparent glass beads. To obtain a retroreflective surface, usually the beads are applied to the surface of wet paint. SWARCO‘s glass beads with a high refractive index (made from recycled glass from window manufacturers) are incorporated into single- and multi-component liquid paints and polymers. SWARCO’s reflective thermoplastics have extended lifetimes of eight or more years, good for busy city streets. Prizmalite retroreflective coatings contain specific barium titanate glass microbeads, hemispherically coated with reflective aluminum: “The hemispheric aluminum coating creates the mechanism for retroreflectivity since light passing through the clear half of the glass bead ‘bounces’ off the reflective aluminum-coated back, directing the light back to the source.” The beads are incorporated into the resin as a filler, however, the matrix confines the spheres to the surface due to surface tension. Positioning spheres on the surface is important for reflectivity, since they have to catch the light. An emerging application of retroreflectivity is reflective coatings for bicycles. At night bicycles can be almost invisible, putting riders in danger. With a little determination, you can “reflectorize” some parts of your bike and by painting it then sprinkling beads on it, following instructables‘ suggestions. If you don’t want to go the DIY route, Halo Coatings has a patented retroreflective powder embedded in a transparent coating. Halo’s liquid coatings can be applied to plastic, rubber, and other composites. By coating the entire frame and both rims, the Lumen has more reflective surface area than any existing bicycle solution. Each bike will be painted with hundreds of thousands of microscopic spheres. As light enters those spheres it boomerangs right back to the source. This effect — known as “cat’s eye” — is visible up to 1,000 feet. The coating, which appears as an iridescent charcoal gray in daylight, is used on the frame and the wheels of this handmade bike. Will retroreflective bike helmets be next? Maybe, but for now, you can apply a reflective decal or tape to increase visibility! Source: “Glass Beads. Minireflectors for nighttime visibility of road markings,” swarco.com. Source: “Retro Reflective Applications,” prizmalite.com. Source: Paint Your Bike / Bicycle / Gear Reflective!” by goodgnus, instructables.com. 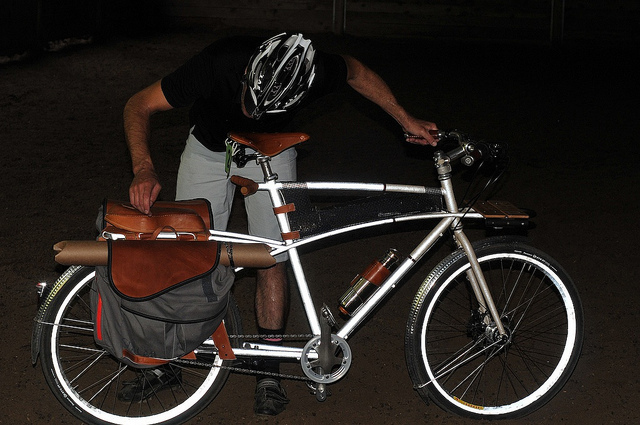 Source: “Lumen: A Retro-Reflective City Bicycle,” by Mission Bicycle Company, kickstarter.com. Source: “Retro-Reflective Coating Solutions,” halocoatings.com. I have a handmade frame and fork that I built myself. I’d like to have you paint it with reflective paint. This frame has never been painted. Contact me. Check out http://hubpowderworks.com/ they are a company that speciallizes in powdercoating bikes with HALO retroreflective materials. Tim (tell Emily “The Tim” sent you). How do I get my hands on some of this paint? Thank you for taking the time to read our blog and reach out for more information! In response to your question, we think the best way for you get your hands on this paint or reflective coating is to reach out to Halo Coatings or Mission Bicycle Company. These companies both manufactured products with retro-reflective qualities. They will probably have more direct answers for what you are specifically seeking. Question. Do these beads reflect all frequencies of the light spectrum (UV to IR)? Are they tailorable? Previous Post: What Is Gas Chromatography? Next Post: Plant Communication: A Pesticide Alternative?